Which camera option is the right one for me? The type of data you are looking to collect and analyze will determine the sensor required for the Trinity payloads. 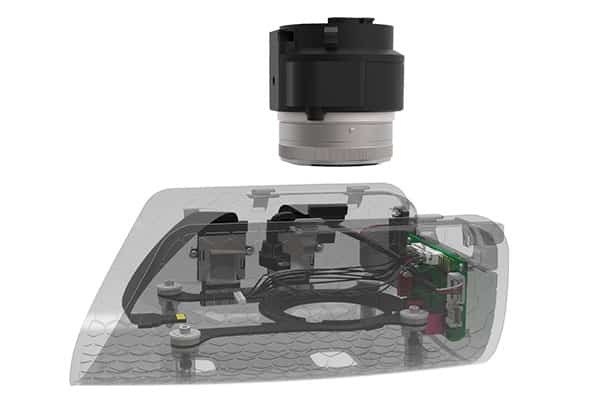 Every payload option for the Trinity includes the payload compartment with a payload management board (PMB) for autopilot controlled triggering and geo-tagging. Shock absorbers increase the data quality even more! The PMB connects the sensors to the autopilot and battery. In addition it serves as a data logger by monitoring the actual power consumption of the sensors which enables us to mix and match each trigger point with the necessary flight data. We offer the compartment as a free download for you in order to adapt it to your application if you feel the need for it. The Sony UMC-R10C 20,1 MP (APS-C, (23,2 x 15,4 mm) Exmor® CMOS) Sensor is our recommended sensor for applications like surveying & mapping, archeology, mining, stock volumes, geotechnical engineering, GIS, disaster control, civil engineering and forestry. It features good inner orientation, a low distortion and fast shutter speeds necessary for our UAVs. Our NDVI sensors provide accurate multiband data for for wide-ranging agricultural remote sensing. Currently we support sensors from MicaSense and Tetracam in the NDVI application area. Depending on customer requirements, the sensors can also be combined with RGB cameras to cover an even greater range of functions (CPC). The MicaSense RedEdge M is an absolute powerhouse and at the same time very compact camera ideal for our VTOL UAVs. It simultaneously captures five narrow spectral bands and uses the change in reflectance of plants in the border between red and near infrared spectrum. The global shutter design creates distortion-free images on every platform. With the RedEdge M the user is not only able to determine conventional vegetation indices like NDVI, NDRE or SAVI but can also draw conclusions about crop health through the additional rededge band. That provides a more accurate measure of not just plant vigor but plant health. The camera is already integrated in our payload compartment and includes a Downwelling Light Sensor (DLS) which is already part of the Trinity. The calibrated reflectance panel for the RedEdge-M is included in a soft case. Featuring the Tetracam Snap 80 gram NIR-RED/GREEN Multi-Spectral Imaging System with an electronic global Snap-shutter. The NIR bands enable this sensor to capture the amount of near-infrared radiation a surface such as soil or a leaf reflects; useful for applications like calculating indices such as the Normalized Difference Vegetation Index (NDVI). 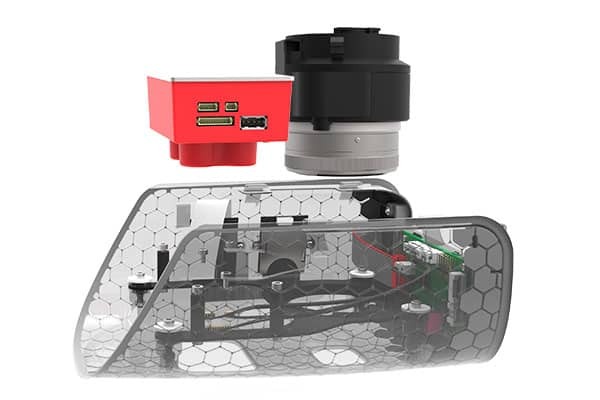 This package combines RGB and NDVI sensors and offers the best of both worlds! It is ideal for applications involving advanced agricultural analytics like growth & health monitoring, volume calculation and insurance projects.